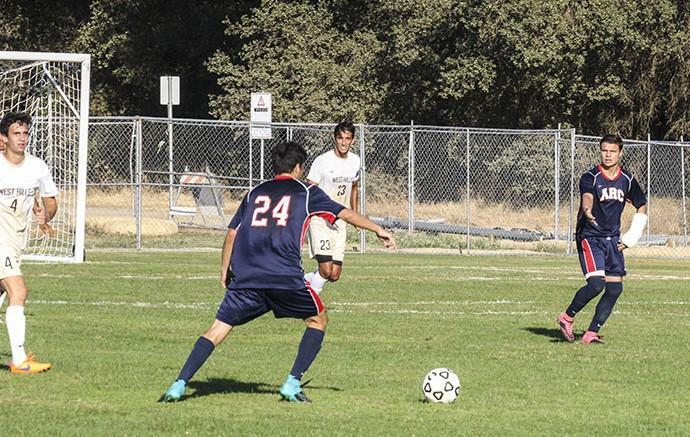 American River College men’s soccer team pulled its second win of the season with a late goal scored by midfielder Eduardo Cervantes-Magana to make it a 1-0 over West Hills College Lemoore. ARC started off the game strong with a lot better tempo than previous games in the season by communicating more with one another, more tactical play, and a showing a better overall team work with each other. West Hills had first possession and made good use of it with fast and aggressive play. ARC’s defence was in trouble early on, but its strong coverage was able to regain possession and get the ball out. ARC’s offence showed improvement, specifically in strategy. Compared to earlier in the season there is more touches between players, controlling the time of possession, and making sure that there was more than just one man downfield in order to help out during scoring drives. Half way through the first half West Hills received a red card, which was pulled on West Hills sophomore forward Moises Martinez who shoved an ARC player while the ARC player was trying to deflect a shot. The rest of the first half West Hills was down a man and ARC went on the attack. “We thought it was an even game when it was 11 vs 11, but when they went down a player we started our attack,” said head coach Paul Hansen. ARC had a lot of close calls scoring but weren’t able to sink a shot in, but there was a stronger sensation of passion and drive to win from the team throughout the whole first half of play than other games this season. The second half started with both teams having 11 players on the field, ARC had first possession and started off with the same drive and motivation that they started the second half with. West Hills had played a lot more aggressively in the second rather than the first half and ARC was plagued by penalties called in the opening minutes of the half. Both teams had a spread style of play which kept the middle of the field open and ARC noticed this and adjusted accordingly with West Hills defence. A player that really came out to play was sophomore midfielder Alex Rizzo who stopped countless drives from WHL and played really aggressive but smart soccer. “I came into this game wanting to get two wins in a row … You can ask anybody who has played with me or watch me played I play aggressively,” said Rizzo after the win. Rizzo was relentless with his play with multiple massive headers, ankle breaking moves, textbook slide tackles, and overall brute force to stop WHL’s drive while getting the crowd and his fellow players pumped. Aproximately 20 minutes left in the game ARC goes for another surge up field when freshman midfielder Eduardo Cervantes- Magana finds a wide spread WHL defense to expoit for ARC’s first and only goal of the game. “It was my first goal of the season and I really thought I was gonna miss,” said Cervantes-Magana after the game. WHL tried a few more drives but ARC held tight and made sure to keep possession so they could run the clock and keep their lead. “They were a tough team and we knew it was going to be a hard fight, but we played a faster paced game like our game against Sequoias,” said head coach Hansen after the game. Coach Hansen’s concluding message for the team was for the men to enjoy the win and that it will give us the self confidence we needed heading into our game against Fresno. 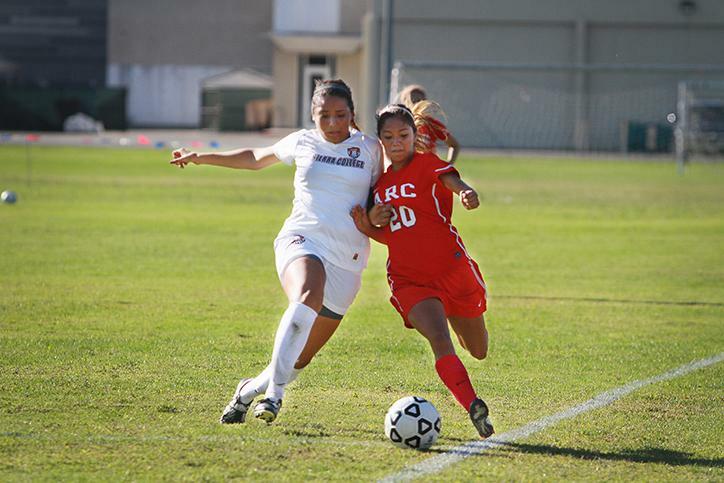 ARC will look for it’s next win of the season on Oct. 15, 2015 against Fresno who is coming off a 1-0 win against Cosumnes River College. Be the first to comment on "ARC men’s soccer gets two wins in a row"